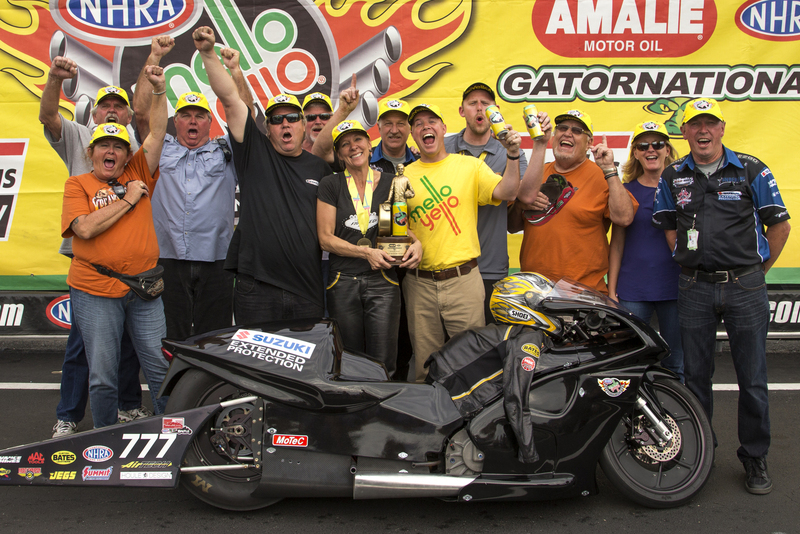 The 2015 NHRA Pro Stock Motorcycle series kicked off in dramatic fashion at the Amalie Oil Gatornationals in Gainesville, FL. The high anticipation of a new season was dashed as a string of bad luck besieged the top racers. In the end Karen Stoffer - who has not raced since Indy 2013 and had not considered running the Gators just weeks ago – outlasted the field for her first win since 2011. Optimism is always high at the first race of the season. 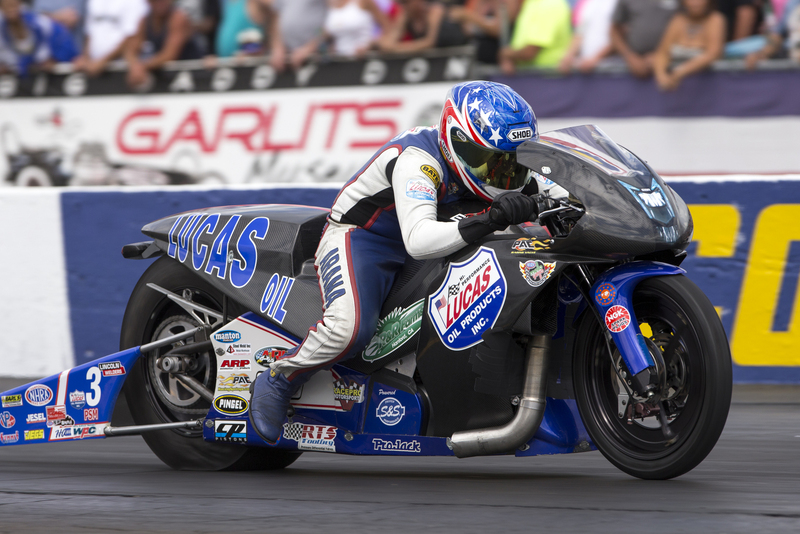 New teams, new bikes and new alliances brings new enthusiasm to the NHRA series. Top of the list is two-time champ Matt Smith who inked a major deal with Victory® Motorcycle to field a pair of Victory-branded race bikes. It marks the first time a new OEM fielded a bike in NHRA competition since the introduction of the S&S-powered Buell® in 2003. Victory is going all-in, with a major display area in the pits and having Smith navigate the tricky NHRA process of approving a new competition body. 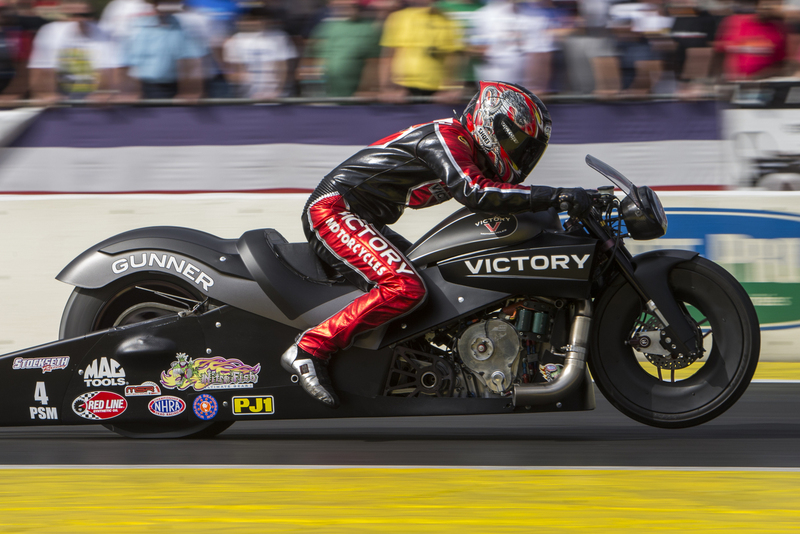 The new race bike is based on the Victory Gunner and powered by the S&S Pro Stock motor. Smith will run two bikes this season with him and his wife Angie on board. Smith did well by his new sponsor, qualifying number one in the fast Saturday qualifying session with a run of 6.867 seconds at 194.02 mph. Ironically, wife Angie would face him in the first round of eliminations, having made the field in the 16th spot at 6.992/189.20. With the sun shining as eliminations opened, Smith was dealt a crushing blow. A shop rag was left inside the body and was sucked into the engine during the burnout. Smith was able to re-start the bike but with the bike smoking, NHRA officials shut him off. Wife Angie took a single but lost to eventual winner Stoffer in the next round. It was a heartbreaking turn of events for the MSR team. Also debuting a new body at Gainesville was the Lucas Oil team of Hector Arana and his son, Hector Jr. The new bike is based on the Erik Buell Racing (EBR) 1190RX. The production EBR 1190RX is a v-twin sportbike, which makes it a perfect subject for a Pro Stock Motorcycle body to wrap around a current S&S-powered Pro Stock Chassis. The Arana team struggled with the body in race conditions. Vertical gaps between the front wheel well and side panels cause air to get inside the body making the bike unstable at speed. Sr. swapped back to his old Buell body but Jr. did not have the option of a spare body. Jr. contacted NHRA tech officials and according to him they originally allowed the slits to be taped but then recanted when he ran a 6.88 in the final session. With the final run thrown out, Jr. was seeded to face his dad in the opening round. Citing safety concerns, he opted to sit out, leaving the exciting and good-looking EBR bodies on the sideline. Angelle Sampey was back on the track in Gainesville after coming out of retirement last season only to injure her ankle in a non-racing pit accident two races later. She made noise on the unsponsored S&S-powered Star Racing Buell, leading qualifying on Friday with a 6.891. She improved on Saturday to a 6.872 but slipped to the second spot behind Matt Smith. 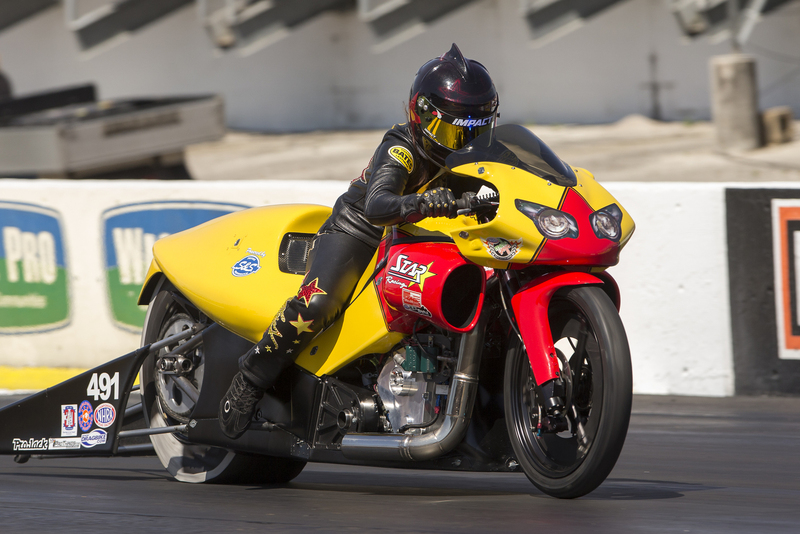 Angelle was the highest seeding rider in round two of eliminations but a throttle position sensor malfunctioned and she lost to the Suzuki® of LE Tonglet. As eliminations progressed the Harley-Davidson® team of Andrew Hines and Eddie Krawiec looked destined to claim the winners circle but mechanical gremlins sidelined them as well. Hines had a transmission fail in the round two and Krawiec had an air shifter line come off in the final against Stoffer. In the end Stoffer was able to outlast them all. The well-like veteran last raced at Indy in 2013 and wasn’t even considering racing Gainesville six weeks prior to the event. Husband Garry decided to dust off, update and repaint their Suzuki TL and enter the fray. She qualified 8th at 6.904 and was not without her own mechanical problems. She broke her transmission twice in qualifying and with only one motor, had to make the time-consuming repairs two days in a row. It was Stoffer’s seventh win of her career and second win at Gainesville. It was only the third win for a Suzuki in the last four seasons.